While trialling digital marketing AI, Albert, online lingerie retailer Cosabella was also putting Ascend, a website optimisation AI through its paces. Ascend is one of the products created by Sentient Technologies, a decade-old tech company specialising in AI founded by the team that invented the tech behind Apple's Siri. Jonathan Epstein, senior vice-president international of Sentient Technologies, explained: "One of the fields [Sentient Technologies] is excelling in is in a field called evolutionary algorithms, which is the basis for Ascend. It mimics natural selection to find the optimal answers to find the large-scale problems." Cosabella came across Sentient, around the same time it encountered Albert, chief executive, Guido Campello explained. "Courtney [Connell, chief marketing officer] and I attended a conference in Boston last October to see what we could implement that would bring us forward technologically," he said. Besides looking for a better way to run digital marketing, Connell was also on the hunt for the best way to optimise Cosabella's ecommerce website. According to Sentient, Cosabella had employed other agencies and technologies before to solve this problem but the uplift wasn't as significant as they'd hoped – primarily because Connell had more ideas than most testing solutions could handle. "State of the art tech in this field is currently A/B testing, which while effective is very slow" explained Epstein. "Ascend is created to apply evolutionary algorithms to website optimisation. This means marketers can test multiple hypotheses as once, as many as 60 ideas can be tested simultaneously. And the AI doesn't just test the ideas, it looks for the best combination to achieve the goal you set for it." Traditional testing would have taken six to 12 months of testing, instead of just seven to eight weeks. Thomas Lyne, IT manager for Cosabella found Ascend to be much faster than traditional A/B testing. "Ascend could test the whole funnel at once, and the results have been instant", he said. The first test was to optimise site elements for a higher number of conversions. 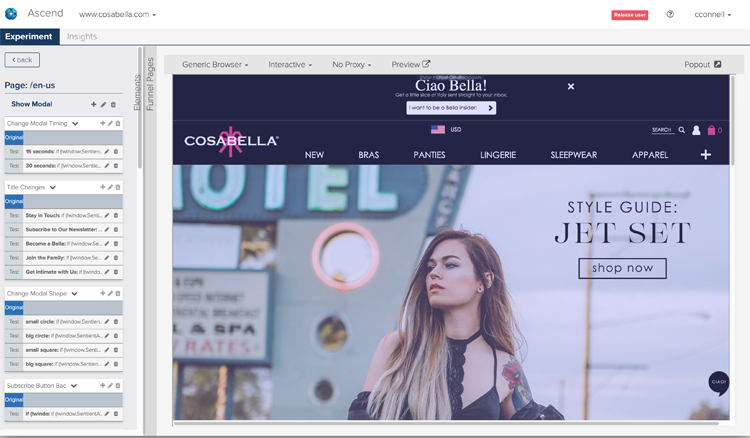 Cosabella tested four different site elements – the header, button colour, image size, and call-to-action placement. They had a total of fifteen ideas spread throughout those elements which amounted to 160 possible designs in that first test. Through several generations of testing, Cosabella learnt a few important things – bigger images help conversion rates, pink (the brand's colour) "buy" buttons work better than black ones, and messaging about their culture work better than messaging about prices. "The results opened our eyes to things that, while we thought they were important, turned out to be even more important than we were giving it credit for," Campello said. In some cases, the team had to compromise aesthetics sometimes for the sake of effectiveness, he added. The pink "buy" button, for example, was originally designed as a black button to make it look more luxurious and elegant. The results of making these changes have been compelling. The site's conversions increased by 38% after seven weeks of testing. Next on the list was increasing the number of newsletter sign-ups. In a few months of testing, Ascend found a design which worked over a thousand-percent better at getting people to sign up. "It's just subtle differences in colours and words that made all the difference," Campello said. Although both are AI programmes, Albert and Ascend are very different, Campello observed. "What we do with Albert is a daily constant variable update. Constantly looking for how we can make quick changes that directly reflect our ad spends and the way our brand is perceived. Ascend is more about our back-end functions and site functions." Epstein described the dichotomy as having Albert focused on effectively and efficiently delivering the highest quality experience. "Once the customer gets to the website, it's up to Ascend to make sure we get the most out of those people." Despite the differences in the AI platforms, Campello said his team took to both with surprising ease. "What's amazing is how quickly a young team with no training in AI were able to adapt and work with these two AIs. "They grew accustomed to speaking the language, using the service, challenging themselves and applying the challenges. The moment we turned them on, everything went very fast." Campello and his team are brainstorming to see what their next step will be. "It will soon be six months since we started using AI and we've been attending a few shows to see what's coming down the line. We know that customer retention and that experience for returning is a big focus for us."